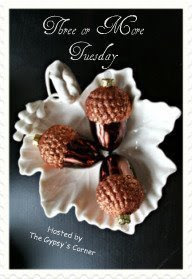 Today I am participating in Three or More Tuesday hosted by Tam at The Gypsy's Corner. This is our chance to show three or more of something that we can't live without. Today I'm showing off some of my polka dotted dishes. Who can resist polka dots? Not me! Polka dots are a little spot of happy. Don't you think? The bowls above are from Southern Living at Home. Love them! They are the perfect size for a big ol' bunch of homemade ice cream made by my hubby! This bowl above caught my eye last summer in downtown Edmond. It has a larger sister that needs to come home with me too. I hope you all have a great Tuesday. Summer is flying by...go out an enjoy it! I just adore all your happy dots here...I can't even choose a fave because I luvvv them all..
Now I must go back and read some of your posts that I've missed..I am getting so so far behind. Just can't move around Blogland very fast....to much to see! So cute and precious Stacey! I do love your sweet dotted things. The last bowl is beautiful. I don't have any polka dots on any home decor' items right now. Yup, I love the polka dots too! Fun collection... Your little blue birds are cute too! Ooohhh...cute polka dots!!! I love all of your polka dot bowls...too adorable!!! I remember seeing those bowls...I can't believe I let them get away:(!!! Love the dots! I even remember having dotted swiss dresses when I was a little girl. My favorite was a light blue one that my grandmother made. I always enjoy your posts. Have a great day. Polkadots are so cheerful and they will never go out of fashion. You would love the polkadot china of Emma Bridgewater. I makes your whole day fun. Thanks for sharing. For The Sake of Time, sounds like me. I had a blue dotted swiss dress my grandmother made for me.I love the bowls. Good Morning Stacey, you are so right about polka dots... they do make you feel good...Loved all your dots!!! You're right, who doesn't love polka dots? Your bowls are fabulous! Polka Dots are great! :0) I love your bowls...very cute! Hope you have a great day! Polka dots are fun, fun fun!!! Love the ice cream bowls Stacey. Stacey, I am a polka dot lover, too!!! I love yours! I have lots of blog catching up to do also! Miss a few days, miss a lot!!!! I have the same polka dot bowls from Southern Living at Home. Aren't they just the best size? We use 'em for everything...even ice cream! These make me smile. I love them. Thanks for coming over. I am your newest follower. I absoltuely love your polka dot collection. Polka dots just put a smile on my face. Oh how fun, Stacey! Even in the picture of the three tomatoes they look like polka dots!! what pretty polka dots. As I look around my house, I don't think I have anything polka dotted but yours sure are pretty. I may have to add something, even a little something polka dotted to my things. Thank you for sharing with us, I love them all! I love polka dots. They are so cheerful! Your blog is wonderful! Thanks for stopping by mine.
" a little spot of happy " ~ I really like that! cute dots! Pretty polka dot bowls look even prettier when you finish adding your touches. This last one is my favorite...the greens in it add so much! I've always liked polka dots. Happy Tuesday to you! This is the "happiest" post of the day! I love it. I too am a polka dot loving gal. It thrilled me to think that my laundry room gave you ideas for yours. Thanks!